The Government has introduced a Bill that would regulate gambling advertisements on radio, TV and online. If passed gambling advertisements could be limited on SBS, commercial operators, and other outlets. However, Labor has proposed an amendment to the Bill that would exempt SBS from the provisions of the Bill. The Bill supports the best interests of children under Best interests of the child: Article 3(1) of the Convention on the Rights of the Child by providing mechanisms to ensure, if required, that broadcasters and online content service providers respect community standards and reduce the exposure of vulnerable Australians, including children, from access to potentially harmful gambling promotional content. 87.1% of 1,176 SBS viewers surveyed in every state and territory believe gambling advertisements on SBS decrease social cohesion (which is the opposite of what SBS purports to be about), and 91% said SBS ought to cease broadcasting these types of advertisements. It was RESOLVED that Save Our SBS calls on the parliament and SBS to totally ban all betting and gambling advertisements across all time slots on SBS and Save Our SBS believes that the promotion of betting and gambling is inconsistent with the SBS Charter, and inconsistent with the ‘social cohesion’ purposes articulated in the SBS Corporate Plan. Save Our SBS supports the Bill as a step in the right direction although we would have preferred tighter regulation reflective of the above resolution. 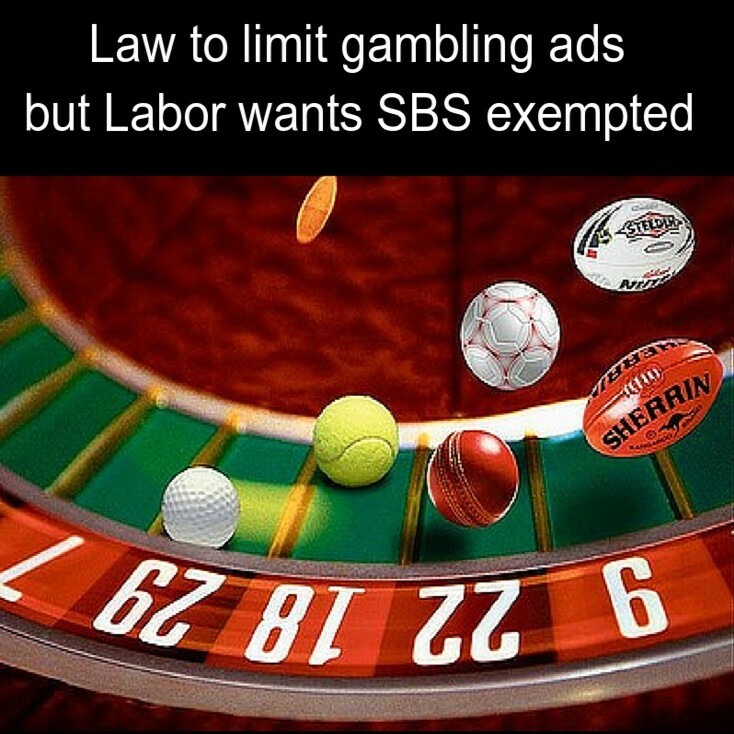 Effectively, Labor’s amendment would mean gambling ads on SBS would be self-regulated via SBS’s own Codes of Practice without rules or community standards imposed by the industry regulator, the Australian Communications and Media Authority (ACMA). SBS could change its Codes at whim and thereby side-step its own self-regulation. Under the Broadcasting Services Act (BSA), SBS is not required to consult the community in developing its Codes of Practice. But commercial broadcasters must do so. Although under the BSA commercial broadcasters Codes are subject to ACMA’s scrutiny, SBS’s Codes are not. SBS believes it ought to be exempt from the new law because public broadcasters are independent of ACMA. Under the Special Broadcasting Service Act (SBS Act), "it is the duty of the Board to maintain the independence and integrity of the SBS". There is no proposal to remove that requirement from the SBS Act (with or without Labor’s amendments). In our view, SBS lost its integrity on this issue the moment it began broadcasting gambling ads a few years ago. Under a different Board and management and before it adopted the fierce commercial direction it now has, SBS refused to broadcast these types of advertisements. SBS could easily have modified its own Codes long before this Bill to show it is a good corporate citizen. In our opinion, SBS failed to do that. We believe the broadcaster places more importance on advertising dollars than the welfare of children or building social cohesion in this respect. It has repeatedly ignored its own ‘social cohesion’ purposes contained in its Corporate Plan with its socially irresponsible, aggressive commercial approach. If SBS were exempted from the Bill, we would not be surprised if it used its commercial advantage to aggressively chase gambling advertisements. Save Our SBS believes that gambling advertisements are worth about $4m per year to SBS. Under the SBS Act, the SBS Board are responsible for the types of advertisements that SBS may broadcast. Save Our SBS understands that one Director who supports gambling advertisements on SBS with a passion, is Bill Lenehan. He worked in management at Network Ten before taking up a directorship at SBS in 2012. However, the decision to accept – or chase – gambling ads is not supported by all the Directors on the Board. If passed, the Communications Legislation Amendment (Online Content Services and Other Measures) Bill 2017 will establish a regulatory framework, i.e., online rules, which can be used by ACMA to prohibit or regulate gambling promotional content provided by online content service providers in conjunction with live coverage of sporting events. The Bill will also provide ACMA with the power to (if directed) determine program standards about gambling promotional content which apply to certain broadcasters and subscription providers. That includes commercial free-to-air television, commercial radio, subscription television, and online services including both ‘catch-up’ services and live online streaming. Without Labor’s amendments SBS will be included too. Labor’s amendment, which was supported by the Greens with cross-bench Senators Leyonhjelm, Martin, and Storer, was defeated in the Senate. and may be opinion only. Some claims might not be factually correct despite appearances to the contrary.